A fire yesterday on a parked Ethiopian Airlines Dreamliner plane has forced both runways at Heathrow Airport to close. No injuries were reported and nobody was on board the aircraft, which was stationed at a remote parking stand. Ethiopian Airlines said the plane had been there for more than eight hours before smoke was detected, adding that "the cause of the incident is under investigation by all concerned." A spokesperson for Heathrow said the plane suffered an internal fire and that the airport's emergency services attended the scene. All arrivals and departures were temporarily suspended due to the fire which was reported shortly after 4.30pm yesterday, but the airport soon re-opened. Passengers at Gatwick Airport experienced minor delays on departing flights as it assisted with diversions. Separately, another Dreamliner operated by the holiday company Thomson has been forced to turn back mid-flight after technical problems. A statement from the company said: "Thomson Airways can confirm that flight TOM126 travelling from Manchester to Sanford, Florida experienced a technical issue and the aircraft returned to Manchester Airport, as a precautionary measure. "Passengers have disembarked and our dedicated team of engineers are now inspecting the aircraft. Our customers will be moved to an alternative aircraft to ensure they get away on their holiday as soon as possible." Footage from the Skycopter over Heathrow showed fire retardant foam on the runway around the plane with at least nine fire engines in attendance. 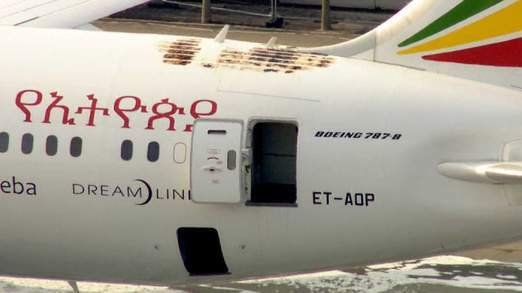 The pictures also appeared to show damage to the top of the Dreamliner's fuselage at the rear of the plane. A Boeing spokesman said: "We're aware of the event. We have Boeing personnel on the ground at Heathrow and are working to fully understand and address this." Boeing temporarily withdrew the Dreamliner from service earlier this year for modifications after concerns that batteries on board could cause fires. Various production problems delayed the aircraft from entering passenger service for three years, operating its first commercial flight in October 2011 for Japanese carrier All Nippon Airways. Speaking from Heathrow, Sky's Stephen Douglas said: "There's nothing at the moment to say that the battery was behind this fire. But as far as Boeing are concerned, it's not very good for the brand of the Dreamliner and not very good for other companies like Virgin Atlantic who are about to take delivery of these Dreamliners because if it is the battery then they could be grounded again." The European Aviation Safety Agency said it was too early to say whether that would happen, adding that "Boeing staff will investigate and we will follow closely to see what to decide." The company's shares fell dramatically on the New York Stock Exchange following the news from Heathrow. The US National Transportation Safety Board has said it is sending a representative to London to assist in the investigation.